Paris-based artist Mademoiselle Maurice’s unique street art takes her delicate origami pieces and places them in the urban landscape. 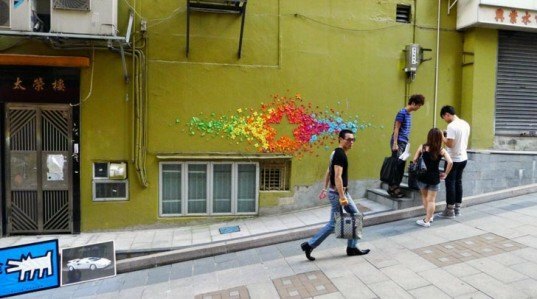 The artist’s distinct brand of origami has been brightening up walls on the streets of Hong Kong and Vietnam with beautiful infusions of rainbow colors all carefully arranged into bold patterns. Prior to taking off for Asia, Mademoiselle Maurice cut and folded hundreds of origami shapes in her Paris studio. The tiny delicate paper components were carefully folded into origami stars, roses, birds, pinwheels are other geometric shapes, before being packed up and taken to the streets of their new home. 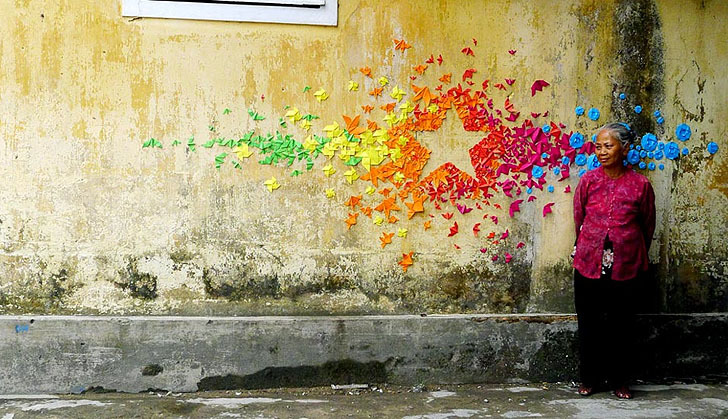 For her the installations in Vietnam, the artist wanted commemorate the nation’s flag with a star. One installation was set on a chartreuse-painted building, with hundreds of tiny pieces radiating from an outlined star. Each of the folded paper sculptures represent the Vietnamese people, from students to farmers to intellectuals, who have historically fought for their independence. Other works in the past have simply spelled out the word “NO,” in protest. While many rely on symbols to communicate a message, such as the LGBT triangle, with folded bits joining together to form the shapes. Like the traditional crane shape of origami, Mademoiselle Maurice’s pieces represent peace. Each of the wall installations are bold and alluring, yet entirely ephemeral. They could easily be removed by people, animals, rain, or wind, yet together their power is enough to incite interest and inspiration. What is "ＡＲＴ“？ Art is in your daily life, it is your attitude toward who you are, what you are, it(art) really doesn't need to cost you arm and leg to "get it", it is in you. For her the installations representing Vietnam, the artist wanted commemorate the nation’s flag, with a star. One installation was set on a chartreuse-painted building, with hundreds of tiny pieces radiating from an outlined star. Each of the folded paper sculptures represent the Vietnamese people, from students to farmers to intellectuals, who have historically fought for their independence. Like the traditional crane shape of origami, Mademoiselle Maurice’s pieces represent peace. Each of the wall installations are bold and alluring, yet entirely ephemeral. They could easily be removed by people, animals, rain, or wind, yet together their power is enough to incite interest and inspiration.